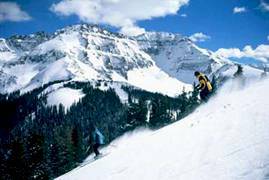 See Forever is more than a name for Tellurides longest ski run. As my skis hit the velveteen powder and I soared down nearly 3-miles of trail, the staggering beauty of the San Juan Mountains stretched before me. It was a feeling that I could Ski Forever on this mountain: Perfect powder, perfect slopes, and perfect ambience. 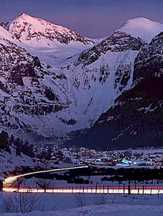 A town, only 12 blocks long and eight blocks wide, tucked into a picturesque box canyon, lay below my ski tips. We treated ourselves to a ski vacation for Valentines Day last February, meeting friends from Tucson at one of their favorite ski haunts. We werent disappointed with their recommendation: Telluride, Colorado, a small town in southwestern Colorado that was a bustling gold and silver mining town 100 years ago. The weather was perfect as we headed to the hill, trail map in hand. Blue skies above; fresh powder frosting the runs. We decided to make first tracks off Lift 7 since we were staying at the Coonskin Base, and head down blue and friendly Lower See Forever to warm up. Hopping onto Lift 4, we sought out new stashes on our next runs off Smuggler, Peek-A- Boo and Misty Maiden. We planned on coming back to Gorrono Ranch for lunch, but first we attacked the infamous face of Telluride, The Plunge. (Photo: Gus Gusciora, TS&GC) Its a steep, knee-rocking and boot-rolling ride! We were feeling like experts as we bumped our way down this 3,140-feet vertical drop to the town below, when suddenly a local Telemarker zipped past us! "Did you see that," my husband shouted? Our heady heads were quickly deflated as we realized the locals were the real experts here! A bit winded, we hit the Gondola and rested our sore thighs on the ride back up. We zigzagged our way up the mountain, cooling our heels on Chair 5 and sweet runs like Alta and Woozeys Way to the top of Chair 6 where we prepared for some more excitement. Lots of black diamond and double diamond challenges kept our adrenaline flowing. I suffered a bit on Giant Steps while my husband polished it off. We hiked up to hit the powder bowls of Electra, and Dynamo on our next two runs, admiring the beauty of Prospect Basin and Gold Hill on our left. Tellurides mountain trains phenomenal athletes. Tellurides Surge Garden Park, the largest snowboard park in the southwest, offers more than eight acres of berms, banks, tabletops, pyramids, and a Rail Garden for exciting sliding. We rode the gondola with a young member of the U.S. Ski Teams snowboard development team, and then watched in amazement as she performed freestyle aerials in the park. Telluride has a number of locals who have reached national rankings in snowboarding and skiing, and compete at the World Cup level. This season, the terrain of Telluride is nearly doubled with the opening of Prospect Bowl and Gold Hill with 733 acres of skiing and three new high-speed detachable quads. 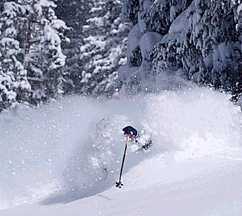 Its an area experts will respect with intimate glades, deep powder bowls, backcountry experiences and chutes for "face shot" skiing. Corduroy groomers, sleek runs and rolling terrain will make the area attractive to beginners and intermediates, too. With its northern exposure and abundance of snow, powder hounds will be able to find champagne powder all day long below the jagged peaks that flank the bowl. Telluride is more than just snow riding. We loved taking the free shuttle from our condo into the heart of the town and strolling through the old world charm of its historic Victorian homes that grace the narrow streets. A colorful past is part of its history: Butch Cassidy laid plans for his first bank heist here, over a century ago. Farmhouses, refurbished homes, and a former train depot now house great restaurants, coffee haunts, wine gardens and art galleries. A pair of cowboy boots and a fleece pullover will let you pass as one of the locals in town where you can wolf down burgers or munchies at Smugglers. But be prepared for a wide variety of cuisines that will tantalize your palette. Theres a touch of Tuscany at Campagna, ranked the highest Italian restaurant in Colorado by the Zagat survey. Their Tonno alla Griglia, a mouth-watering grilled fresh tuna sent our taste buds spinning. For the beef-lover in us, we sank our teeth into a luscious blackened New York strip at The Bluepoint Grill, a mid-priced seafood and steakhouse with its swanky Noir Bar downstairs. A more casual spot with a Mexican flair is Jodys Kitchen, on Davis Street. Their fish tacos, fresh salsa and vegetarian enchiladas are terrific. One of our favorite haunts, Allreds, located at the top of the gondola, a timber and stone building perched above the town, offers staggering views of the mountains and town lights below. (Photo: Ken Gallard, TS&GC) The Mountain Village has high-end hotels and condos, great eateries, swanky boutiques and ski-in ski-out convenience that many travelers desire in a ski holiday. We enjoyed the complimentary gondola ride up St. Sophia ridge from the rustic town to its mid-mountain elegance. We toured a few properties that offer the ultimate in pampering, but for our tastes, the town was a better fit for our budget and style. 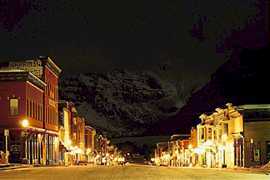 Telluride is a small town with a BIG Mountain to explore. Its a perfect getaway for a ski holiday. For days off the slopes, there are spas, hot springs, backcountry adventures from cross-country skiing and snowshoeing to dog sledding, heliskiing, and paragliding. Of course, never forget the shopping! Too much to do and too few days to do it. Better check our calendars to see how soon we can return to catch what we missed! We could ski forever! 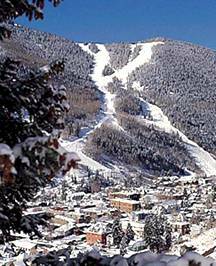 Click here for details to plan you own trip to Telluride, Colorado.